La Vita in Equilibrio creates bespoke voyages of discovery in yoga and meditation, while exploring the cultural and culinary secrets of Italy. Each holiday embraces the enchanting natural splendour of the region, the allure of its history and customs, alongside the simple flavour of seasonal ‘slow foods’ and local wines. I believe travel experiences are transformative and can improve our well-being. These immersive Escapes are designed to inspire, rejuvenate, and optimise your flow while you reconnect — with yourself, with others, and the vibrant spirit of Italy. My aim is to create a memorable harvest of tastes as we evoke the cultural diversity of regional cuisine. Prepare to be enchanted by local connoisseurs as we uncover time-honored traditions and learn about the techniques that make la tavola Italiana so special. Each one of my Escapes is unique and designed to arouse curiosities while nourishing the soul. We will marvel at art, indulge our palate, dip our feet into ancient myth, manifest the creative — as we uncover the hidden gems of Italy, and the gems inside of you. La Vita in Equilibrio partners with local chefs, biodynamic wine specialists, artists, writers, tastemakers, astrologers, along with me, Lisa, your yoga teacher — all are storytellers lulling you into a profound sense of well-being. Anticipate a truly transformative feast! Lisa Dunn is a yoga teacher whose compassionate, free spirit is mirrored in her practice and enthusiasm for life. A mother of three, Lisa recently hit the pause button on a fast-paced London life, and found her home in the glory of Rome. Having left a successful career producing documentaries for the BBC, Lisa pursued her passion for yoga and became a certified instructor. She has been practicing for 15 years and is keen to share the liberating effect this has had on her life. 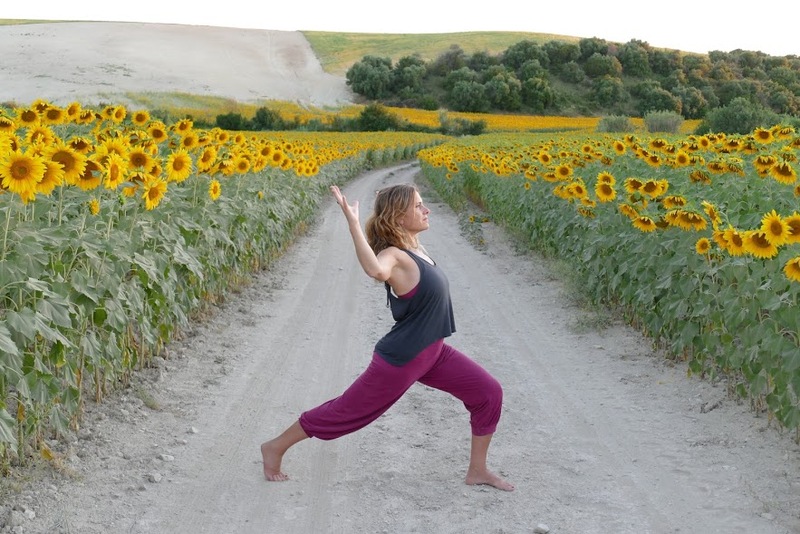 Her personal journey has taken her all over the world, and most recently to Suryalila Yoga Retreat Centre in Spain. La Vita in Equilibrio was spurred by Lisa’s love for yoga, travel and a life-long romance with Italy — a place that has always been a spiritual homecoming for her. Lisa’s teaching approach is a reflection of her radiant personality and instinct. She brings a contemporary eye to time-honoured traditions, and draws on the universal teachings of yoga, both on and off the mat. With an emphasis on the breath, and intelligent sequencing, her classes are crafted to empower her students to develop their practice, and be motivated to maintain a safe, and life-long yoga experience. Lisa’s bespoke La Vita in Equilibrio Escapes give her the opportunity to share her personal restore + explore philosophy, as well as her love of Italian culture and cuisine. Lisa hopes you will feel inspired and renewed by all the splendour that Italy has to offer, and join her for some laughter, release, and of course, a glass of Prosecco!